Albrecht Christoph von Quast (* March 10, 1613 in Leddin; † May 17, 1669 in Spandau) was a secret counsellor of war (Geheimer Kriegsrat) and Major general of the Margraviate of Brandenburg. He served under “the Great Elector” Friedrich Wilhelm of Brandenburg and was victorious against the Swedes in the wars in Nyborg on the island of Fyn (Funen) in 1659. Note: The Margraviate of Brandenburg (German: Markgrafschaft Brandenburg) was a major principality of the Holy Roman Empire from 1157 to 1806 which played a pivotal role in the history of Germany and Central Europe. Little is known about the childhood and youth of Albrecht Christoph during the Thirty Years’ War. He was born on the Rohr estate and was and was Lord of the manor of Garz as well as the acquired manors of Vichel, Rohrlack, Küdow, Damm, together with Wutzetz (1661) and the Zootzen Forest. In addition, he served as the governor and chief captain (Oberhauptmann) of Spandau Citadel. His mother was Ottilie von Rohr (* 1586; † July 16, 1667), one of the Rohr from Leddin. On Oktober 11, 1610, she married his father Albrecht von Quast († 1626 in Leddin). 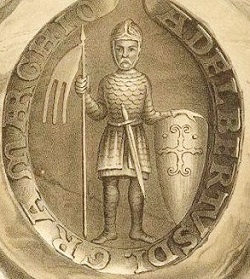 Seal of Albert the Bear. Note on Spandau Citadel: The origins of Spandau are attributable to a Slavic settlement, created at the junction of Havel and Spree rivers. From this gord a fortified castle emerged until the end of the 10th century. In 1157, in the course of the German eastern settlement this castle wall got under possession of Albrecht der Bär (Albert the Bear, c. 1100 – 1170; the first Margrave of Brandenburg), who rebuilt it to its needs with a new west gate and the new Havel river bridge. This castle wall constituted the eastern cornerstone of the newly created Margraviate of Brandenburg. Spandau Citadel was completed in 1594. From 1626 during the Thirty Years’ War, a garrison was stationed at Spandau and the city walls expanded. In 1686, the Lynar Castle was made into a prison. In 1722, by order of King Friedrich Wilhelm I., it was reinforced by the construction of a gun factory. Spandau’s status as a military town did not change until the end of the 18th century. His father died early and Albrecht Christoph most probably attended the Ruppin school without much enthusiasm due to wartime. At the age of seventeen (1630) his military career began as a musketeer in the King’s Infantry Regiment. He performed his first guard duty on the Fehrbellin dam, not far from his later home Garz. Until the year 1645 he had been spared from large wounds; his second injury – a painful and dangerous injury to the sole, heel, and edge of his foot by a bullet – left a paralysis of the foot after a lengthy healing. 1650 he first left the military (Swedish service) temporarily, yet with no intention to leave for good. 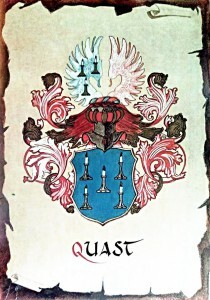 After his separation from the military and his return from Sweden to the Margraviate of Brandenburg, Albrecht Christoph von Quast – who had acquired a considerable fortune during the war – acquired two paternal manors from his cousin Otto von Quast, namely the estates of Garz and Küdow. Otto sold his manors to his cousin Albrecht Christoph for the sole reason that his wealth would remain in the Margraviate of Brandenburg and would not get lost abroad. In 1663 he bought a half share in Wutzetz estate and in 1664 he bought the manor of Vichel from Adam of Pfuhl, his old comrade in arms. But his life as a lord of manors was of short duration. Shortly after 1655, he joined in the service of Friedrich Wilhelm, the “the Great Elector” of the Margraviate of Brandenburg and Duke of Prussia. Little is known about the latter years of the life of Albrecht Christoph von Quast, he probably retired to the countryside with his family to rebuild his estates. In 1667 he received the order by prince-elector Friedrich Wilhelm to enlist and establish a new regiment and was appointed governor of the fortress of Spandau Citadel by the prince-elector. He died on May 7, 1669 at the Spandau Citadel and was buried in the family tomb of the von Quast in the St. Nikolai Church of Spandau. As he had no children, the son of his brother Wolf Gottfried von Quast – his nephew Johann Albrecht von Quast (* 1653; † February 26, 1705), became his heir. Johann Albrecht was lieutenant of the Margraviate of Brandenburg. Albrecht Christoph von Quast began his military career in 1630 at the King’s Musketeer Infantry Regiment of Fehrbellin. Following the passage of the river Elbe, Albrecht Christoph proved himself on September 17, 1631 during the Battle of Breitenfeld. Battle of Breitenfeld (1631) between Imperial formations and Sweden (excerpt). 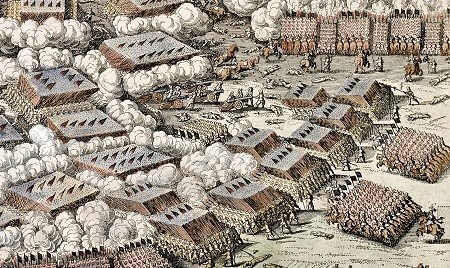 Furtheron, on November 6, he participated in the Battle of Lützen (1632), and on Juni 26, 1633 at Hameln, where the King’s Infantry Regiment was almost completely annihilated: In June 1633 the Imperial troops – i.e. mercenaries from various Catholic countries – and the allies of the protestant Swedish under Duke Georg von Braunschweig-Lüneburg clashed in a slaughter of nearly 30,000 men, more than 5000 deaths. The end of the King’s Infantry Regiment was the end of Christoph Albrecht von Quast as a musketeer. He became a Dragoner (dragoon, mounted infantry) instead. Map of the troop dispositions during the Battle of Lützen (1632). The life as a musketeer and dragoon was not the life of Albrecht Christoph von Quast, although he felt himself called to the trade of war already early. So he oriented himself on his – later famous – Brandenburg compatriot Hans Christoph von Königsmarck (March 4, 1600 in Kötzlin; † March 8, 1663 in Stockholm), a German military commander in Swedish service who commanded Sweden’s legendary flying column. Königsmarck entered the Sperreuter Cavalry Regiment (established January 1636 as Sperreuter-Cürassiere/ cuirassiers) in the rank of an Oberstwachtmeister (major). Albrecht Christoph von Quast followed him and also entered this regiment, receiving corporal-ship (Korporalschaft), commanding a group of about 30 men strong. Musketeers during the 30 Years’ War. Photo: Wagner: Ars bella gerendi, 1980. Following the betrayal by Sperreuter – who wished to convert the whole regiment to the Imperialists, however, was followed only by single detachment – the command over this cavalry regiment was transferred to Hans Christoph von Königsmarck, since he resisted Sperreuter’s order and remained faithful to the flag, as did Quast. For Field Marshal Johan Banér (1596–1641), Generalissimo of the army, this faithfulness was reason enough to promote Königsmarck to the rank of a an Oberst (comparable to a colonel; commander of regiment or battalion-sized formations), ordering him to establish a new cavalry regiment from those companies that had remained faithful. Albrecht Christoph von Quast entered this new Königsmarck’s Regiment as a quartermaster (Quartiermeister; General Staff Officer) and within a year was first promoted to Cornet (a commissioned officer rank in cavalry troops, once the bearer of the Troop’s flag or Cornet) and later to Lieutenant. Dragoons during the 30 Years’ War. Photo: Wagner: Ars bella gerendi, 1980. He has quickly made himaself a name by his courage and his skill in the field, which led General Stahlhantsch becomig aware of him and wanted him as a participant in 1639, when General Stahlhantsch led the legendary “flying column” to Silesia. In the rank of a cavalry master (Rittmeister) Albrecht Christoph von Quast now entered Stahlhantsch’s corps, where he later stood under the command of General Goldstein. Since February 24, 1645 Quast participated in the Battle of Jankau, the bloodiest of the Thirty Years’ War, from which the Swedish troops under Lennart Torstenson (* 1603; † 7. April 1651) emerged victorious. Outcome of this battle was the conversion of the Imperialists to and their siege at Brno in Bohemia (Czechoslovakia). Quast participated in this siege as well and was wounded for the first time while trying to prevent outbreaks of the Imperialists. After an unsuccessful siege of Brno due to the excellent defense by Jean-Louis Raduit de Souches (1608-1682) and the withdrawal of Torstenson’s troops to Bohemia, Torstensohn issued the order to Colonel Copey to occupy and fortify Kronneuburg with 1000 musketeers. Placed at Colonel Copey’s side was von Quast, now promoted to lieutenant-colonel (Obristlieutenant) and commander of a 200-strong cavalry corps. For this brave defense – the last great military operation by von Quast in this war – he was promoted to the rank of colonel (Oberst) by Count Palatine Karl X. Gustav (1622 – 1660), King of Sweden and Duke of Bremen-Verden. In 1648 he stood as a cavalry colonel and leader of his Cavalry Regiment in Munster-land region (with the Teutoburg Forest in the northeast, the river Lippe in the south and the Dutch border in the west) and in the year 1650, after the dissolution of the regiment,he first resigned from the military. Note: Albrecht Christoph von Quast was featured in Theodor Fontane’s “Wanderungen durch die Mark Brandenburg”. 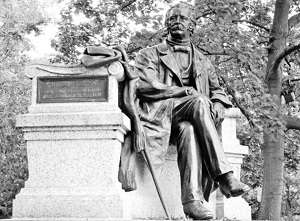 Fontane was a German writer, born December 30, 1819 in Neuruppin. Since 1860 he worked as a journalist in Berlin, war correspondent in 1870, passed away September 20, 1898. Fontane is regarded as subtle portrayer of the landscape and folklore of the Mark. Among his works are »Gedichte«, »Wanderungen durch die Mark Brandenburg«, the novels »Vor dem Sturm« (1878), »L’Adultera« (1882), »Graf Petöfi« (1884), »Irrungen, Wirrungen« (1888), »Stine« (1890), »Frau Jenny Treibel« (1892), »Effi Briest« (1896), »Die Poggenpuhls« (1896) and others. military history and autobiographical works (»Meine Kinderjahre«, 1894; »Von Zwanzig bis Dreißig«, 1898), »Briefe an seine Familie« (1904) and others. – Brockhaus’ Kleines Konversations-Lexikon, F. A. Brockhaus, Leipzig, 1906. This entry was posted in Quast family history and tagged Albrecht Christoph von Quast, aristocratic family, Coat of arms, Garz Castle, genealo, lineage, Theodor Fontane, Wanderungen durch die Mark Brandenburg. Bookmark the permalink.